Routine tire rotations are an integral part of tire maintenance. Tires that are not rotated tend to develop uneven or irregular wear. Uneven and irregular wear patterns can cause tires to wear out prematurely, can create tire noise, can cause ride disturbances, and may void manufacturer warranties. Discount Tire Direct recommends rotating your tires every 6,000 miles. Many vehicle manufacturers make their own recommendations regarding how often tires should be rotated. However, this recommendation specifically addresses the original tires that come on the vehicle. If you have questions about how often to rotate your tires, give us a call. We are always ready and willing to help in any way that we can. If irregular or uneven wear occurs, it may signify a need to rotate your tires earlier than 6,000 miles. It should be noted, that a variety of factors can cause uneven treadwear, including improper air pressure, suspension issues, vehicle alignment, rotation intervals, and even wheel/tire imbalance. If your tires are showing signs of uneven wear, we recommend having your tires inspected by a qualified expert to determine the potential causes. 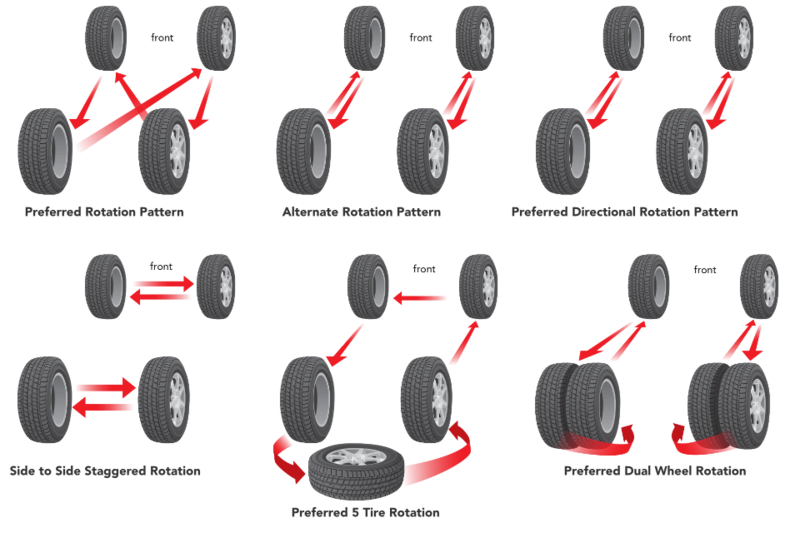 There are many different tire rotation patterns. Both tire and vehicle type will determine which pattern is best to follow. The different rotation patterns are illustrated below. It should be noted that certain tire types cannot be rotated, or can only be rotated in a specific way. Vehicles with staggered fitment tires or wheels cannot be rotated in the preferred or alternate rotation patterns. As long as the tires are not directional, they can be rotated from side to side. If the tires are directional they can be rotated side to side, but in order to do so, they will need to be dismounted and reinstalled facing the opposite direction. When rotating your tires, you should ensure that the air pressure has been set to the vehicle specifications for all of the tires, including the spare. If the tires on your vehicle are not the original equipment, they may require a different air pressure than that which is specified on the door placard. Many vehicles have different air pressure requirements for the front and rear tires. When setting the air pressure in your temporary spare, keep in mind that it may require a much higher air pressure than standard passenger tires. Properly inflated tires help to ensure better handling, more even treadwear, and optimum fuel consumption. Learn more about Tire Air Pressure. It is very important to ensure that all lug nuts have been installed properly and have been torqued to the proper manufacturer specifications. Some vehicles come with full-sized spares that can be utilized in the rotation process. Be sure not to mistake a temporary spare tire for a full size spare tire. The temporary spare is intended for emergency use only, and is not meant for extended usage. If you have a full-sized spare, and wish to incorporate it into the rotation process, it is recommended that you follow one of the preferred rotation patterns illustrated above. Place the full-sized spare tire on the right rear. Take the tire that would have been placed on the right rear and make it the new spare. It is important to note that if you do choose to incorporate your full-sized spare, only do so when it is still new. After a spare has aged without use, it should be maintained as the spare rather than rotated into service with newer tires. If you do have a temporary spare, your routine tire rotations provide an excellent opportunity to inspect the spare tire and check its air pressure, When checking a temporary spare's air pressure, keep in mind that temporary spare tires typically require a much higher air pressure than regular tires. As with other tires, the temporary spare should not be operated if it is underinflated.